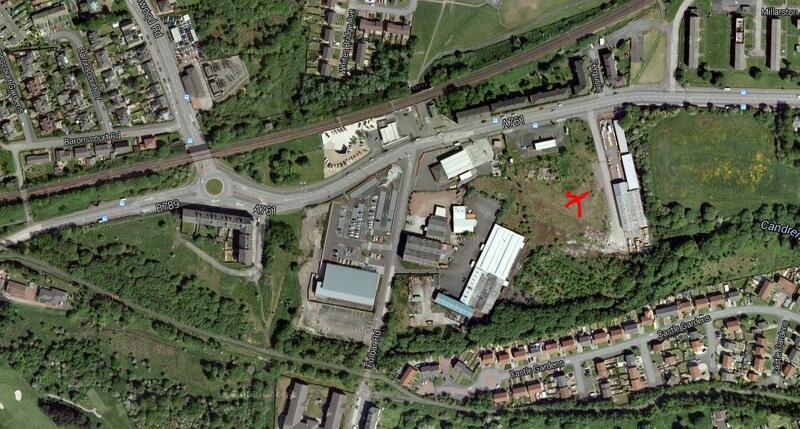 1850 – Ferguslie Fireclay Works started. 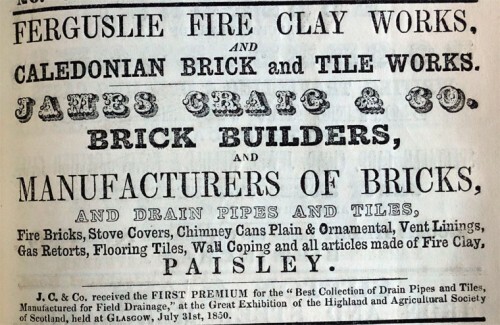 Below – 1852 – Advert – Advert for James Craig & Co, Caledonia Brick and Tile Works and Ferguslie Clay Works, Paisley. 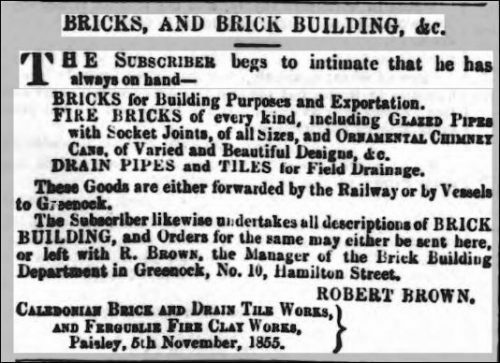 Below – 23/11/1855 – Greenock Advertiser – Robert Brown Advert – Caledonian Brick and Drain Tile Works and Ferguslie Fire Clay Works. 01/06/1856 – South Australian Register Newspaper – Jennings Patent drain pipes – … The remarks of Mr. Stephenson, and other similar statements by civil and sanitary engineers, have led to much attention being paid to the subject of drain and sewage pipes. 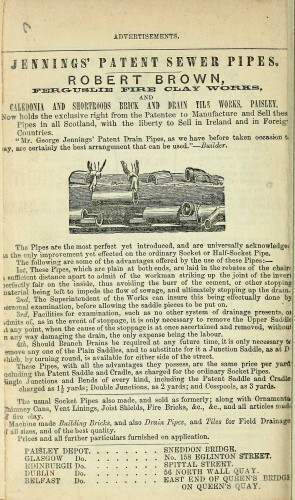 One of the most approved results of this attention has appeared in the form of Jennings’s patent drain-pipes, the essential principles of which are the perfect absence of all internal inequality of surface at the jointing, and the facility with which portions of the pipe may bo unshipped from the chairs or sockets in which they are laid. The professional journals and magazines of mechanical inventions have spoken in high terms of these patent drain-pipes ; but the best recommendation consists in tho fact that they have been very extensively used in many important public works. At the Government prisons, dockyards, barracks, &c., they have been greatly approved ; many Town Councils have adopted them in municipal improvements ; and a host of private builders have preferred them to all others. Our colonial experience in such matters is necessarily very limited; and it is to be hoped that if the Legislature resolve to adopt, not only the principle of drainage, but a particular scheme of works, they will carefully study the plans, sections, and general descriptions of the proposed undertaking. 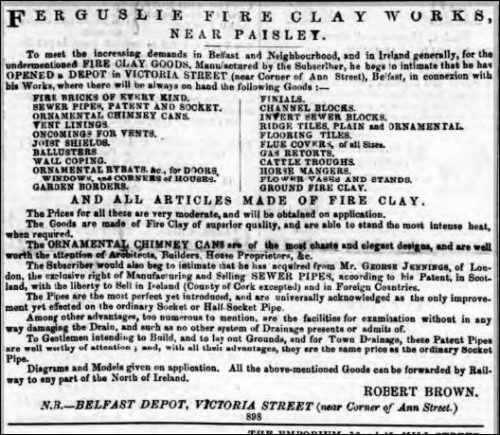 Below – 08/05/1857 – Glasgow Herald – Ferguslie Fire Clay Works Advert. 08/08/1857 – Paisley Herald – Highland Agricultural Society Show – ….there are rick standards, field gates and iron fences of great beauty, weighing machines for carts, and cattle enamelled clay troughs and tiles of every size. 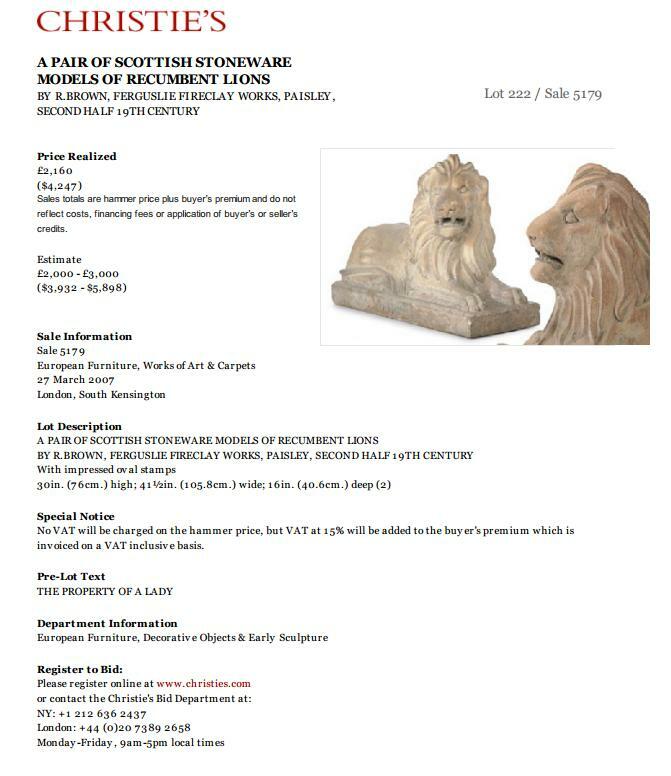 Provost Brown of the Caledonian Brick and Drain Tile Works and of the Ferguslie Fire Clay Works, is a large exhibitor in these departments……Awards ..Section 73 – Glazed socketed pipes for sewage – Premium £1. 1. Robert Brown, Ferguslie Fire Clay Works. 2. P.B.M MaCredie, Perceton, Kilmarnock commended; John Robson, Cook Street, Glasgow, commended. Below – 1858 – Ferguslie Fireclay Works, Paisley. 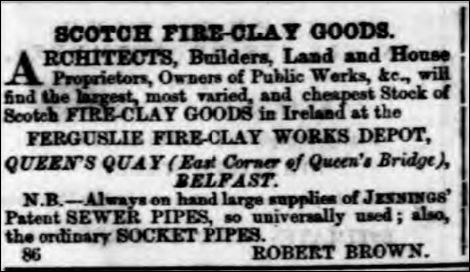 Below – 21/04/1859 – Belfast Morning News – Ferguslie Fireclay Works advert. Below – 30/04/1859 – Greenock Advertiser. – Robert Brown advert for Jennings Sewer Pipes. 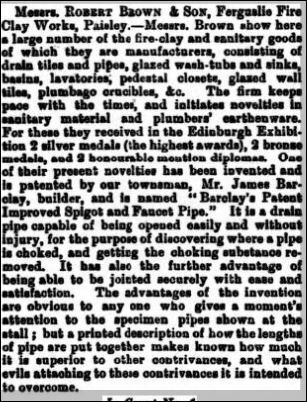 Below – 30/12/1859 – Glasgow Herald – Robert Brown, Ferguslie Fire Clay Works, Paisley advert re making and selling Jennings patented pipes. 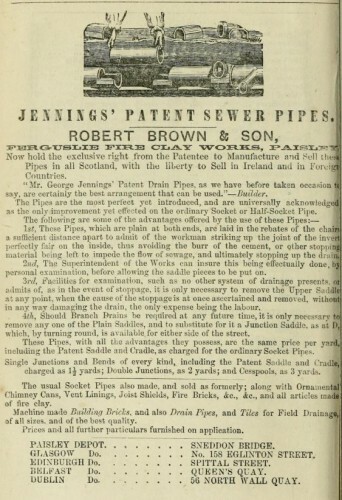 13/01/1860 – Glasgow Herald – Patent Sewer Pipes – Robert Brown, Ferguslie Fire Clay Works, Paisley has the exclusive right from Mr Jennings, the patentee to make and sell these, now universally admitted superior pipes in Scotland, with the liberty to sell in Ireland and foreign countries. Ornamental chimney cans, vent linings, socket pipes, fire bricks etc etc. Prices, diagrams and models and every information furnished on application. 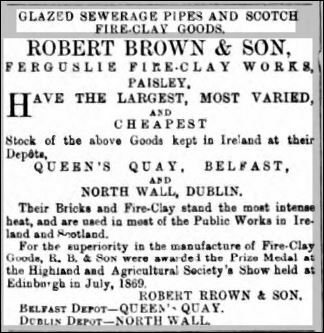 Below – 28/06/1861 – Belfast Morning News – Robert Brown advert with reference to Jennings Patent Sewer Pipes. Pipe or Tile Machine for hand or power, eight sovereigns, George Finlayson, Gighty Burn, Arbroath; …..
Tiles or pipes for field drainage. Two sovereigns – Christie & Son, Shore Road, Stirling. 2d. Bronze medal – Alexander Meldrum, Seafield Tile Works, St Andrews. Glazed socketed pipes for sewerage, three sovereigns John Robson 47 Cook Street, Glasgow, 2d Bronze medal, Robert Brown, Ferguslie Fire clay Works, Paisley. Commended Edmonstone Coal Co, Dalkeith. Extra implements machines etc – Highly commended – Collection of vases, paving bricks, horse manger, pig trough and milk cooler – John Robson. Jennings Patent Sewer Pipes. Robert Brown, Ferguslie Fire Clay Works, Caledonia and Shortroods brick and drain tile works, Paisley. Now holds the exclusive right from the Patentee to Manufacture and Sell these pipes in all Scotland, with the liberty to Sell in Ireland and in Foreign Countries. “Mr. George Jennings’ Patent Drain Pipes, as we have before taken occasion today, are certainly the best arrangement that can be used.” – Builder. perfectly fair on the inside, thus avoiding the burr of the cement or other stopping material being left to impede the flow of sewage, and ultimately stopping up the drain. 2nd, the Superintendent of the Works can insure this being effectually done by personal examination, before allowing the saddle pieces to be put on. 3rd, Facilities for examination, such as no other system of drainage presents, or admits of, as in the event of stoppage, it is only necessary to remove the Upper Saddle in any way damaging the drain, the only expense being the labour. 4th, Should Branch Drains be required at any future time it is only necessary to remove any one of the Plain Saddles, and to substitute for it a Junction Saddle, as at D which, by turning round, is available for either side of the street. These pipes with all the advantages they possess, are the same price per yard including the Patent Saddle and Cradle, as charged for the ordinary Socket Pipes. Single Junctions and Bends of every kind, including the Patent Saddle and Cradle charged as 1 ½ yards; Double Junctions, as 2 yards; and Cesspools, as 3 yards. The usual Socket Pipes also made, and sold as formerly; along with Ornaments, Chimney Cans, Vent Linings, Joist Shields, Fire Bricks, &c., &c., and all articles made of fire clay. Machine made Building Bricks, and also Drain Pipes, and Tiles for Field Drainage of all sizes, and of the best quality. Prices and all further particulars furnished on application. Belfast Do . . . . . . . . . . . East End of Queens Bridge on Queens Quay. 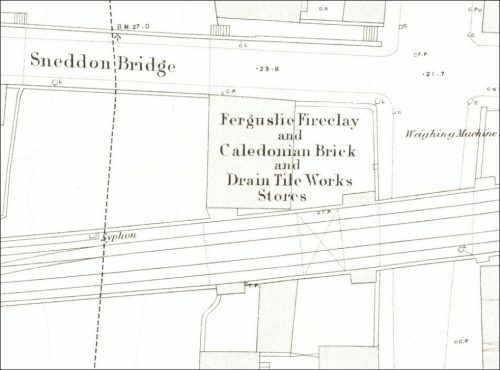 Below – 1864 – Ferguslie Fireclay and Caledonian Brick and Drain Tile Works stores. 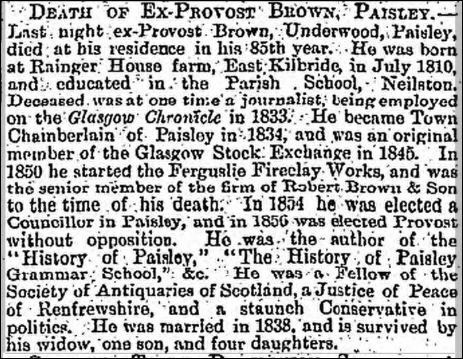 07/05/1864 – Paisley Herald and Renfrewshire Advertiser – Clyde Navigation Bill – Mr Robert Brown examined – l was Provost of Paisley from November, 1856, to November, 1859. I have two separate works at Paisley, and in one of them I manufacture drain pipes for field drainage and also common building bricks. The quantity of drain pipes which I make is very large, and about tbe one half of them is sold in the district and the other half is put into vessels and sent to places on the Clyde and West Highlands of Scotland, and Ireland. The dues present payable on these, for the part they are carried on the Clyde, are one penny per ton. According to the new Bill of the Clyde Trustees this rate will be rather more than doubled. The quantity of common building bricks which I make is also very large. 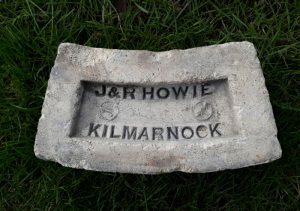 The best market which I have for these bricks is Greenock, and they are either sent there in boats by the Rivers Cart and Clyde or by railway. The carriage of bricks at present by water to Greenock is 6s 3d per 1000, and by railway it is 6s per 1000. At present, therefore, tbe carriage by railway to Greenock is three pence per 1000 under that by the Rivers Cart and Clyde. By the proposed alteration of rates in the new Bill this difference will be increased to sixpence per 1000. The quantity bricks which I have sent to Greenock by tbe Rivers Cart and Clyde and railway together during the last three years has averaged about 800,000 yearly. The selling of the bricks and the drain pipes I have to compete with makers upon the side of the railway who are nearer to Greenook than I am, and also with makers upon the side of the Clyde below the River Cart, on the Forth and Clyde Canal, and also the Ayrshire coast. 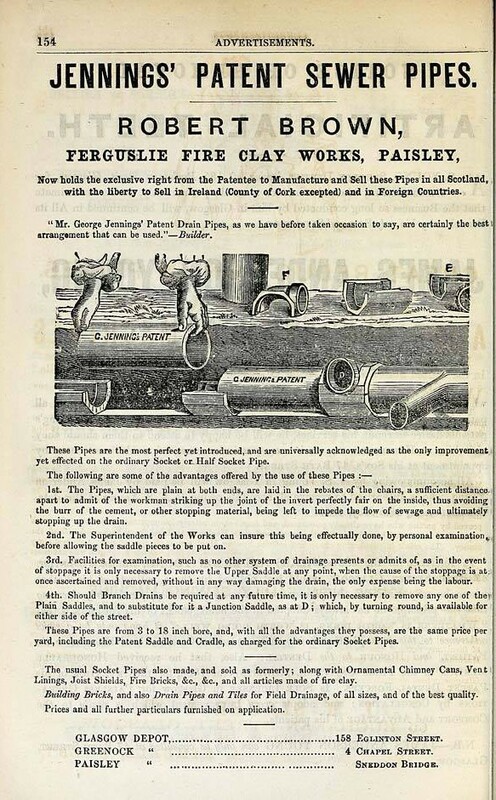 The goods which I manufacture at my other work, called the Ferguslie Fire Clay Works, consist of fire bricks, sewerage pipes, and other articles made of fire clay. I send a very considerable quantity of these goods by vessels down the Rivers Cart and Clyde and which are shipped at Paisley. I have a house at Belfast and also one at Dublin, and the quantity of goods which I send to these places of business is very large. The Clyde dues on these goods are partly one penny and partly fourpence per ton, and by tbe new Bill are proposed to be more than doubled. In selling these fire clay goods in Ireland I have to compete with some extensive works on the Ayrshire coast, and also in Wales. I have also a place of business in Glasgow to which I likewise send these fire clay goods, but they are forwarded by the Paisley Canal. I never send any goods to Glasgow by the Rivers Cart and Clyde, because the expense and inconveniences attending such mode of transit are such as to make it almost impracticable. Some years since an effort was made to send goods in this way for shipment at the Broomielaw but it had to be given up. I find it to be much better and cheaper to send goods by Paisley Canal to Port Eglinton at Glasgow and then cart them to the ship’s side at the Broomielaw. The quantity of coals which I bring from Glasgow along the Paisley Canal to my Fire Clay Works is about 9000 tons annually; and the quantity of manufactured fire clay goods which I send annually to my place of business in Glasgow is about 4000 tons. I am of opinion that if the dues are increased upon the Clyde as proposed it will very much interfere with my business and that of the other traders on the Cart. The vessels which I engage to ship goods at Paisley do not draw more than 8 feet of water when loaded, and the great depth of the water, therefore, which has been obtained in tbe Clyde by expensive operations is not required by me or any of tbe other traders on the Cart. The kind of goods brought to Paisley by the Rivers Cart and Clyde which yields the largest revenue to the Cart Trust is wood and it is about equal to the one half of the whole revenue. The dues paid to to the Clyde Trust on this wood is, I believe, fivepence per ton, and by the new Bill it would elevenpence per ton. I am of opinion that if this increased rate is carried into effect it would be very injurious to tbe importers of wood, and likewise to the revenue of the Cart Trust. Cross-examined by Sergeant Bellasis—The proposed difference in rates would amount to one penny per ton on the use of 12 miles the River Clyde, but which, however, is the double of the present rates. That would take much from the profits of my business, and looking to the competition that exists in Ayrshire and other places it is of the greatest importance that the means of transit should be as cheap possible. The quantity of my manufactured goods which I send down the Rivers Cart and Clyde is about 5000 tons annually. This yields about £20 a-year to the Clyde Trust, and if the Bill passed it would be doubled. To the Clyde Trustees who are such a powerful and wealthy body the proposed increase of rates is but small matter, but the doubling of the rates to the other trustees and myself is of serious importance. At the conclusion of the evidence the Committee found the premable of tho Bill, in so far as it related to a mileage rate not proved. 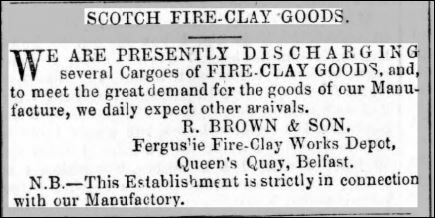 04/07/1865 – Belfast News – Scotch Fireclay goods – Scottish fireclay goods. Builders, Contractors, &c., will find the largest and most varied stock of the above goods kept in Ireland at my depots- Queens Quay, Belfast and 56, North Wall, Dublin. The Goods are second to none in the market and at lowest rates, White bricks (extra finished), for Facing, Buildings, in great variety. Also, glazed sewage pipes, with patent or socket joints. Robert Brown. Belfast Depot-Queens Quay. Dublin Depot-56 North Wall. Works, Paisley. N.B.- Goods can be sent to any Port in Ireland, either by sailing vessel or steamer, direct from the works. 4235. The subscribers have for sale:-Garnkirk Fire brick and clay; Allan & Mann’s white building brick the best brick manufactured); J. & M. Craig’s brick, 1st and 2nd qualities; Do, white and red glazed tiles; Sealy’s Bridgewater tiles and bath brick; Staffordshire black brick, various shapes;Chester tiles and brick; Architectural Pottery Company’s ornamental tiles; cements, London, Portland, Roman; hydraulic limes, &c.; chimney cans, water pipes, &c., &c., &c. W.D.Henderson & Sons. Office-14 Corporation Street. YARD-Albert Square. 4113. 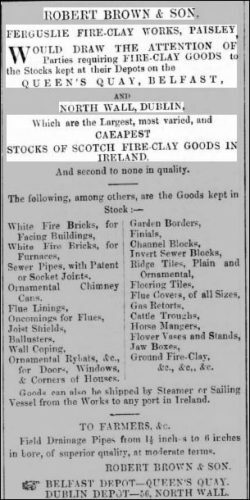 26/04/1867 – Saunders News Letter – …There are specimens to be seen of the Paisley fire clay pipes, troughs,bricks, tiles and vases exhibited by Brown & Sons from the depot at the north wall……..
Below – 11/06/1867 – Belfast Mercantile Register and Weekly Advertiser. 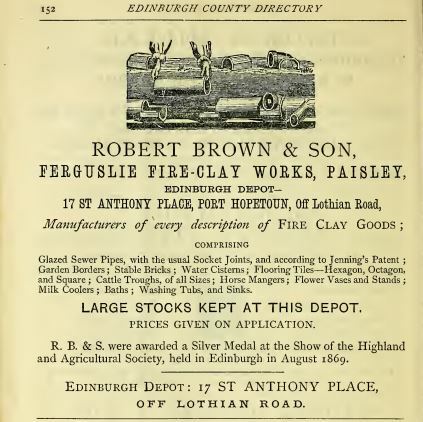 Advert for R.Brown & Son, Ferguslie Fire Clay Works. 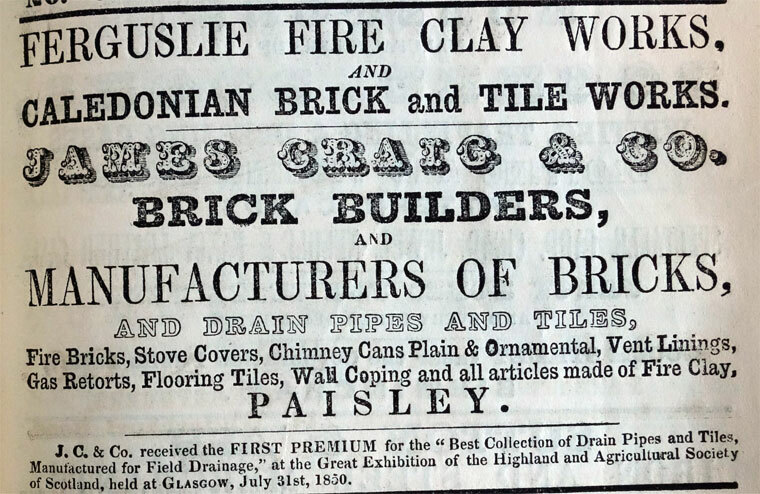 Below – 01/08/1867 – The Dublin Builder – Ferguslie Fire Clay Works, Paisley. 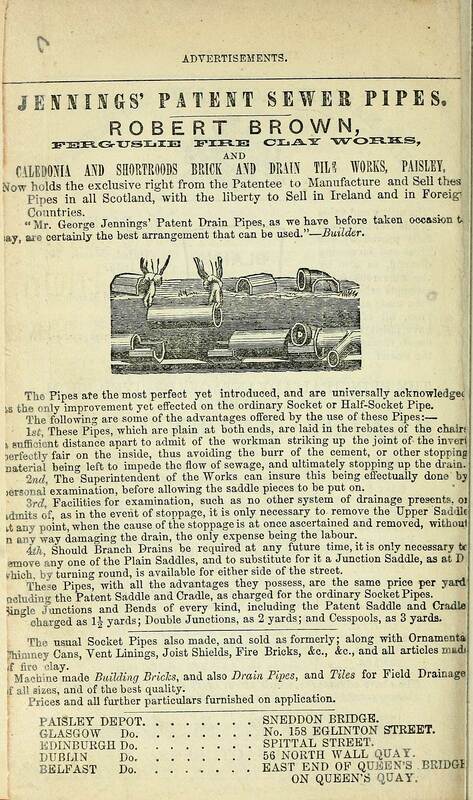 Glazed sewer pipes (patent and socket) and all articles made of fire clay of superior quality, for sale at the depot. No 56 North Wall – Quay, Dublin. Robert Brown & Son. Also drainage pipes of all sizes for field drainage. Prices very moderate. 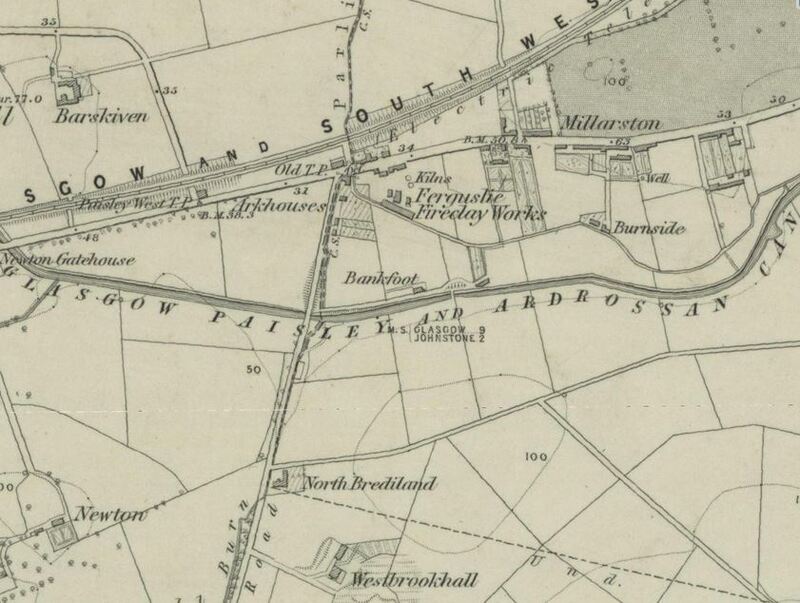 31/10/1867 – Glasgow Herald – Renfrewshire County meeting – The committee minutes showed that Messrs Robert Brown & Son of tbe Ferguslie and Caledonia Fire Clay and Drain Tile Work have made an application to be allowed to make a railway crossing on the Barnsford Turnpike Road, from their works at Shortroods, which the comnittee recommended should be conceded, provided the authorities of Paisley gave their consent to the crossing being made. Mr Speir of Burnbrae said Mr Brown ought to pay a way-leave for the crossing, as other parties are required to do this. Mr Robert Brown said by his crossing he would take off the road a traffic nearly equal to all the rest of the traffic there. The articles which they carted were not valuable like ironstone, but chiefly consisted of tiles for draining, and bricks. After some other remarks it was agreed that Mr Brown should be allowed to make the railway crossing for which privilege he was to pay £7 10s per annum. Below – 17/03/1868 – Belfast Mercantile Register – Robert Brown bricks exported to Belfast and prices. Below – 19/09/1868 – Paisley Herald – The new buildings and street committee – Messrs Robert Brown & Son, of Shortroods and Caledonia Brick and Tile Works, had submitted to the Committee a ground plan of several buildings to be erected by them for another new work between Inchinnan Road and the River Cart, giving notice that the chimney stalk would be 130 feet in height, and also notifying that they intended to cover and divert Bullfauld Burn. The Committee allowed the erections to proceeded with, but agreed to give no opinion as to the height of the stalk, and no sanction in regard to the diversion of Bullfauld Burn, that in case existing rights might be affected, the Messrs Brown alone might be held responsible. 26/12/1870 – Glasgow Herald – Mysterious disappearance – Archibald Black engaged with the vessel Mona, carrying bricks and tiles for Messrs Robert Brown & Son, Ferguslie and Caledonia Brick and Drain Tile Works, mysteriously disappeared about a week ago from Paisley and has not been heard of since. No reason can be assigned for his disappearance. Black is a man about 45 years of age, greyish hair, 5 feet 8 or 9 inches, sharp features and resided 280 Holm Street, Glasgow. 1871 – 1872 – Robert Brown & Son – Town Office Sneddon Bridge – Works Caledonia, Shortroods & Ferguslie. 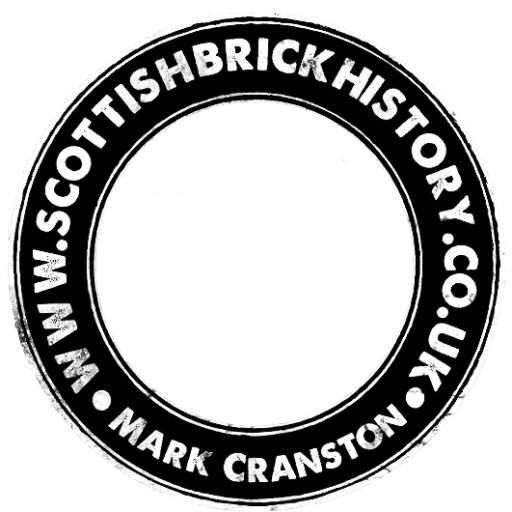 30/03/1874 – Glasgow Herald – Brick building – We beg to intimate that Messrs Bell and Mclauchlan, brick builders, No 2 Glen Lane, Paisley have taken a lease at a part of the brick works at Shortroods, Paisley and we have therefore ceased to manufacture red building bricks and to execute brick building work. As Messrs Bell and McLauchlan were foremen to us in our brick building department for many years we can with the utmost guarantee recommend them to parties with whom we done business and to the Public generally. 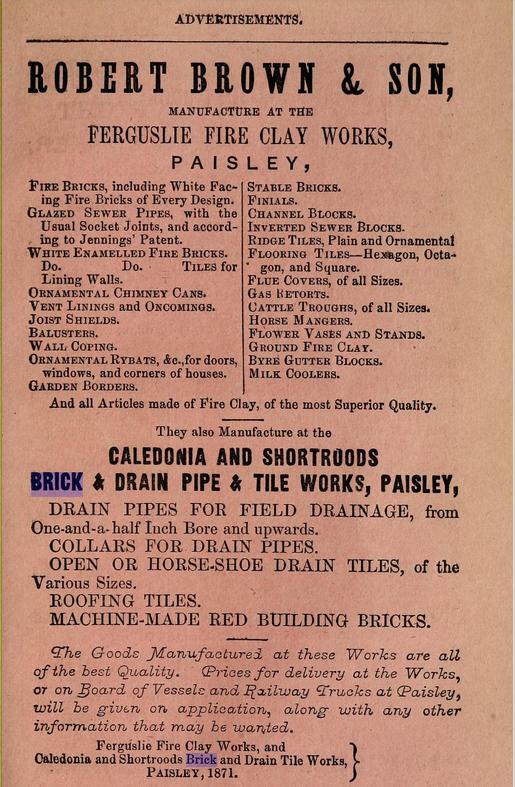 We also beg to intimate that we still continue to carry on the manufacture of drain pipes and tiles for field drainage at Shortroods and likewise to manufacture glazed sewerage pipes and every class of fire clay goods at the Ferguslie Fire Clay Works, Paisley. – Robert Brown & Son, Paisley 27/03/1874. 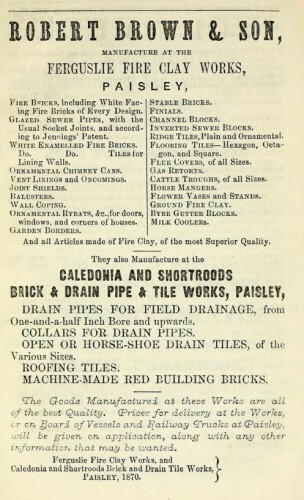 27/07/1875 – Glasgow Herald – Highland and Agricultural Society Show, Glasgow – No visitor in the implement yard will fail to observe and to be pleased with the attractive and tastefully displayed exhibition of fireclay goods and drain pipes by Robert Brown & Son, Ferguslie Fireclay Works, Paisley. Particularly noteworthy are the white enamelled bricks of the same kind as were so much admired recently at the opening of the new ‘Old Clothes’ market inn the city where the internal walls are entirely lined with them. The bricks are pure white in colour and they retain freshness and cleanliness rendering painting or whitewashing unnecessary. They also possess the recommendation of durability. 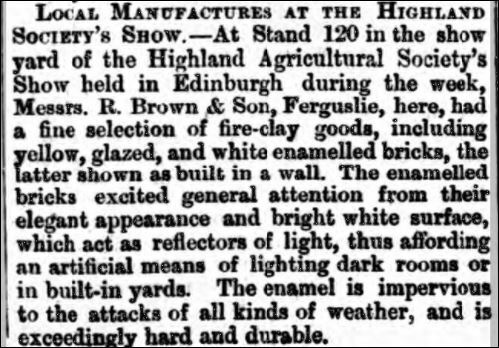 Below – 28/07/1877 – Paisley and Renfrewshire Gazette – Messrs R Brown & Son exhibit enamelled bricks at the Highland Show. 1878 – R Brown & Son, Firebrick manufacturers, 158 Eglington Street, Glasgow. 15/02/1879 – Paisley Gazette – Police Board meeting – Smoke nuisance – Sanitary Committee reported that Bailie Clark had informed the committee that several improvements with the view of preventing smoke had been introduced at the Caledonia Fire Clay Works and had also made reference to the means taken tor the same ends at the Ferguslie Fire Clay Works. Mr. Fisher expressed the hope that the committee would give that matter every consideration. The Clerk said the committee were waiting report from Mr. Green, the Sanitary Inspector, in regard to two cases smoke nuisance. Below – 22/09/1880 – Daily Alta California Volume 32, No 11118. 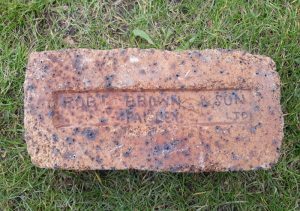 1882 – Robert Brown & Son, Ferguslie Fire Clay Works, Paisley. Office Abercorn Bridge. Below – 26/10/1886 – Edinburgh Evening News – International exhibition – S = Silver, B = bronze and HM = honourable mention. Below – 07/07/1888 – Paisley Gazette – Glasgow exhibition. 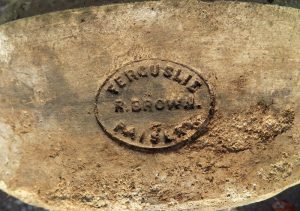 Messrs Robert Brown & Son, Ferguslie Fire Clay Works. Reference to the patented Barlclays patent improved spigot and faucet pipe. 27/12/1890 – Daily Telegraph and Courier – At Paisley to-day the trade arrangements assumed an acute stage inconsequence of the strike. Messrs Spiers. Gibb, and Co., Caledonia Fire-Clay Works, and Messrs. Brown and Son, Forfarshire Fire Clay Works (Note – SBH – I believe this should read Ferguslie Fire Clay Works), have stopped work, owing to the failure of the coal supply. Below – 07/05/1895 – The Scotsman – Death of Robert Brown. 1896 – 1897 – Brown, Robert, & Son, Ferguslie Fireclay Works, Paisley, manufacturers of specially glazed fireclay pipes and traps, sinks and washing tubs in white enamel, superior brown glaze, double dipped vitrified and fine yellow glaze, with enamelled supports or pedestals for same, white and coloured enamel bricks of superior lustre and finish, doable dipped vitrified bricks, and all articles made of fireclay of the most superior quality and finish ; Glasgow depot and office, 360 Eglinton St. ; Telegraphic address, ” Shortroods,” Glasgow ; telephone No. 3498. 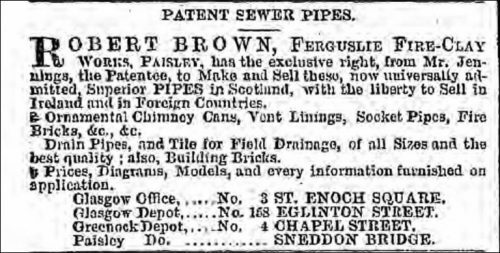 Brown, Robert, & Son, the Paisley Sanitary Earthen- ware Works, Paisley, manufacturers of sanitary and plumbers’ earthenware of every description, including cabinet-stands, lavatories, plug basins, baths, urinals, sinks, wash-down and wash-out closets in ordinary style and pedestal form, all of the most improved and recent designs, and of the finest quality ; also, glazed earthenware wall tiles in all sizes and colours, coloured enamelled tiles, and patent glazed earthenware tiles for ceilings ; Glasgow depot and office, 360 Eglinton street’ Telegraphic address, ” Shortroods,” Glasgow ; telephone No. 3498. 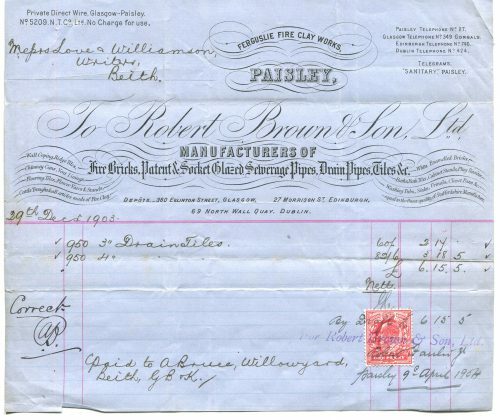 Below – 1903 – Invoice – Ferguslie Fire Clay Works, Paisley. 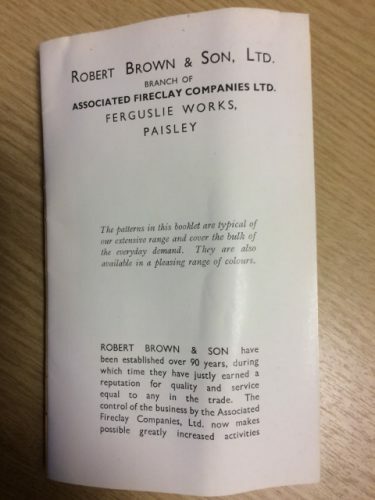 Below – 1935 – Catalogue – Robert Brown & Son, Ltd a branch of Associated Fireclay Companies, Ltd, Ferguslie Works, Paisley. 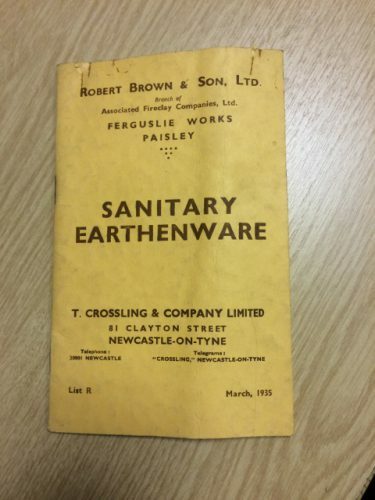 Many thanks to Gordon Alexander for the following photos from a 1935 Sanitary Earthenware Catalogue Robert Brown Ferguslie Works Paisley. 1936 – Asscociated Clay Industries, makers of sanitary ware formed in 1926. By 1936 they own W.R.Pickup, John Crankshaw Co and Robert Brown & Son. 30/07/1936 – Glasgow Herald – article on Associated Clay Industries Ltd and the progress of constituent businesses…..In December 1934 we bought the business of Robert Brown & Son Ltd of Paisley and during the 18 months we have had this business under our control we have made the necessary alterations in the works and been able to improve production and restore the good name which used always to be attached to this firm for sanitaryware earthenware. April 1959 – New Owners for Scots Works – William Baird & Co. Ltd. of Glasgow, have acquired through their subsidiary J & R Howie Ltd., Hurlford Clayworks, Kilmarnock, the Ferguslie Works at Paisley of Association Clay Industries Ltd. J & R Howie will carry on manufacture of vitreous China and earthenware sanitary products at the Ferguslie works as well as maintaining their own Kilmarnock plant. Associated Clay Industries Ltd took over the older Ferguslie works which were founded in 1836 as “Brown’s Brickworks” after the name of the founder Mr. Robert Brown. Since they took over in 1934. Associated Clay Industries have done a considerable amount of improvement work at Ferguslie and modernised considerably in 1947. Modernisation of their four other plants was also needed but because of restricted trading and lack of prospects new capital was not raised and in September of last year a receiver was appointed. 24/03/1971 – The Glasgow Herald – Paisley loses a landmark – Paisley lost a landmark yesterday when the oldest industrial chimney in the town was demolished. The demolition of the chimney at Browns Brickworks on the south side of the main road between Paisley and Elderslie, was carried out by the steeplejack firm of Redmond Bros who used explosives to bring it down. The chimney built in 1837 was originally 286 feet high but over the years the height was reduced. Latterly it had become a danger. The site is now used by industrial and commercial concerns. Below – This is a G Jennings Poole stamp . Found on a water / sewer pipe by Dr Jorg Ansorge in Stralsund (Mecklenburg-Vorpommern), Germany, a sea port town at the Baltic Sea coast. 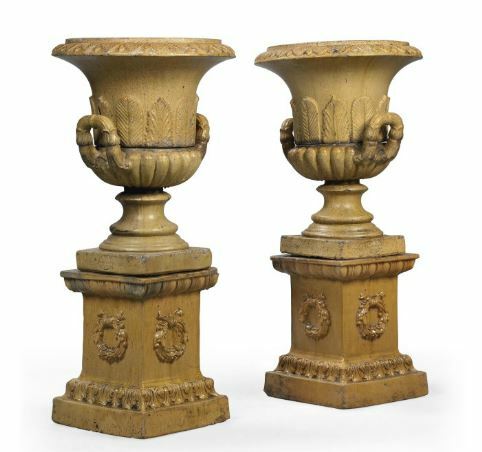 Source Kenneth Sanderson – In 1858 the Robert Brown and Sons, Ferguslie Fireclay Works, Paisley were producing 12,000 tons a year of firebricks, chimney cans, boiler flue covers and ornamental garden vases. This was a large tonnage for those days and must have been built up over some years. 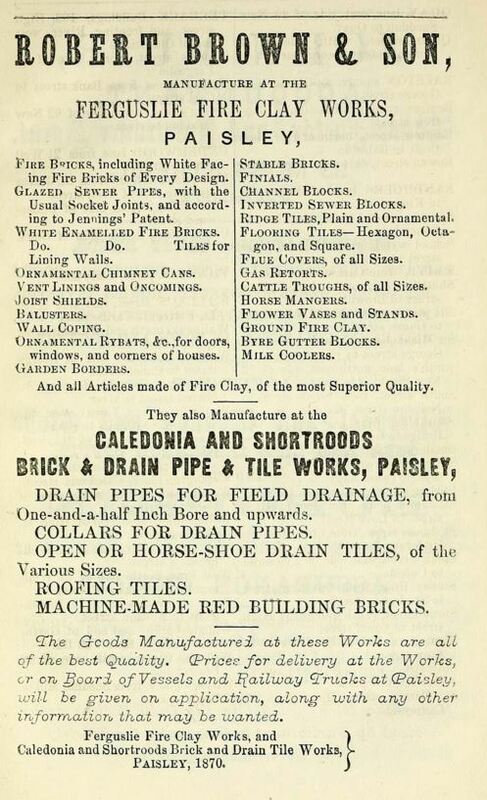 Slaters directory 1867 mentions that they were producing fireclay goods of every description. Robert Brown senior died in 1900 (?) and was succeed by his son Robert who incorporated the company in April 1902. The capital was substantial:25,000 6% £1 preference shares and 25,000 £1 ordinary shares. The profits for the previous 6 years had averaged £7,525 but had dropped ominously in the last 2 years which was said to be due to the large coal price increases. The mineral leases on the lands of Brediland and Meikleriggs were due to expire at Martinmas 1904, only short time ahead. but other sources of fireclay were said to be available locally. Sanitary pottery was said to be the most profitable business and this was based on the raw materials from the south coast of England. Perhaps not surprisingly profits continued to fall and serious losses were incurred during the 1914 – 1918 war. The company struggled on until liquidated in 1934. Ferguslie Fire-Clay Works. These extensive works were established in 1839, and are carried on by Messrs. Robert Brown and Son. The productions are mainly chimney shafts in great variety and of good design, sewage pipes and sanitary goods of all kinds, garden vases and tazzae, flower boxes, suspenders, fern and flower stands, &c. of various designs ; statuary, both single figures and groups, architectural enrichments, pedestals, brackets, garden edgings, fire and other bricks and tiles, copings, finials, &c. Shortroods and Caledonia Works. These are brick and tile works connected with the Ferguslie Works of Messrs. Robert Brown and Co. Paisley Earthenware Works. Messrs. Robert Brown and Co.established these works in 1876, and at them produce white enamelled earthenware goods of a similar quality to those of Staffordshire. Their principal productions are cabinet stands and lavatories of every requisite shape both for domestic and shop fittings, plug basins, pans, and other sanitary appliances, baths of every kind (a speciality being the larger baths, five feet six inches in length, a size rarely attempted in earthenware), washing tubs, sinks, &c., plumber’s fittings, wash hand-table tops, with and without toilet ware, plain and coloured pavement and wall tiles, &c. Crown Works. At the Crown Crucible Works, belonging to Messrs. Robert Brown and Son, plumbago crucibles and kindred goods are manufactured. The marks are a crown and name, BROWN PAISLEY, and a crucible within an oval border surmounted by a crown. Robert Brown was born at Rainger Home farm, East Kilbride, 15th July, 1810. In 1815, his parents moved to Nether Capellie Farm, Neilston, and the boy’s first responsibility was to herd on the braes above Glen Killoch until he reached school age. He was educated at Neilston parish school, and showed an aptitude for Latin and Greek and Arithmetic—the intention being that he should proceed to the University. This intention was departed from, and came to Paisley in 1827 and had built his home ‘Underwood Park’ on Underwood Road. Subsequently going to Glasgow, he acted for a time as reporter and sub-editor of the Chronicle newspaper, which helped to give a literary bias to his inclinations. In 1834, he was appointed Town Chamberlain to the Burgh of Paisley, and in 1845 was an accountant and share broker in Buchanan Street, Glasgow. Having acquired the property of Ferguslie in 1850, he founded the Ferguslie Fire-clay Works. The firm originally produced fireclay linings for furnaces, garden ornaments and statuary for gardens and by 1876 the business had expanded to the manufacture of white sanitary earthenware,wall tiles and bricks. Browns Brickworks remained a significant manufacturer and employer until the mid 1970’s. 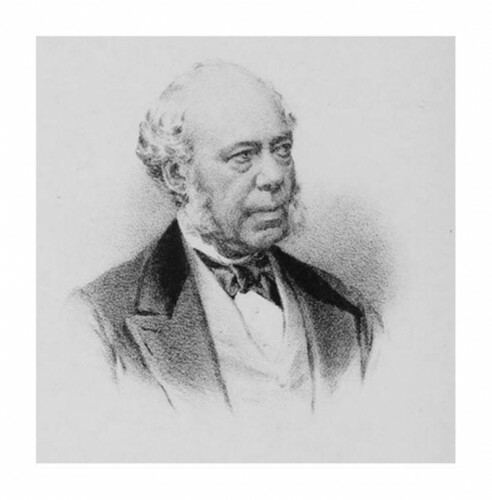 Robert Brown died in 1895 leaving an estate to the value of £23,962 (£2,571,589 today). Found by Eddie McLean in the Glasgow area. The ‘3’ is stamped on an end of the brick. Hurlford Fireclay Works, Galston Road, Hurlford, Ayrshire. . . . . .
Gartsherrie Ironworks Fireclay Works, Gartsherrie, North Lanarkshire. Lugar Brickworks, Cumnock, East Ayrshire. Found by Ian Suddaby in the Aberdeen shire area. Robert Brown, Ferguslie Fire Clay Works, Paisley. (This is a pre ‘& son’ stamp) This is not in my possession. . . . .
Found by Michael Fallone the Glasgow area. 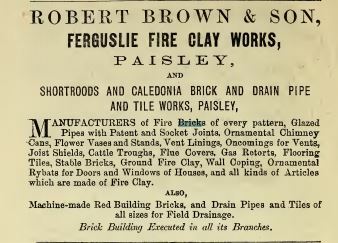 Robert Brown & Son, Ferguslie Fireclay Works, Paisley, Renfrewshire. . . . .
Eglinton Iron Works Fireclay Works, Kilwinning.